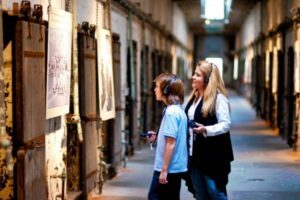 Eastern State Penitentiary was once the most famous and expensive prison in the world. Opened in 1829, the facility embodied a new philosophy: that prolonged isolation would lead prisoners to regret and true penitence. This was the world’s first true “penitentiary,” and the model for 300 prisons worldwide. Known for its grand architecture and strict discipline, the massive prison had flush toilets and central heat before the White House and is lit with more than 1,000 skylights throughout the vaulted cellblocks. Today the prison stands in ruin, and hosts tours and events seven days a week. A critically-acclaimed series of artists’ installations is free with admission.